Looking for homes in Ladera Ranch? Here's your opportunity to have fun while enjoying their Holiday Events. Posted by Teresa Mihelic HelpDesk on Friday, December 9th, 2011 at 12:54pm. Ladera Ranch is one of those dreamy communities when it comes to holiday activities, home decorating, and family fun. Indeed, this past weekend, we visited the community when they were holding their annual Tree Lightning. What a blast! Driving around and experiencing all of these Ladera Ranch homes decorations, reminded me how much I love this time of the year. Some of the neighborhoods even have their own theme, or have put similar decorations around the 'village' they belong to, as part as the festivities. December 10th - Live Nativity Scene at the Town Green from 5:00-7:00PM and individual home decorating contest. December 12th - Neighborhood home decorating contest entries are due by 5:00pm. December 17th - Neighborhood home decorating contest judging from 6:00-10:00pm. December 20th - Menorah lighting from 6:00-7:00pm at the Town Green. 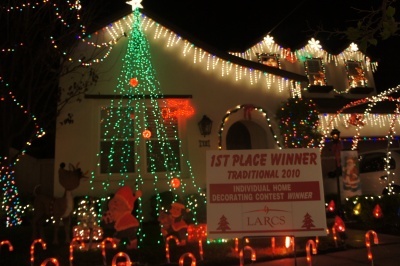 The picture you see is the home that won the 2010 Holiday Decorating contest at. If you are interested in Ladera Ranch real estate , any specific neighborhood or homes and condos information, please contact us and we will be happy to help you.